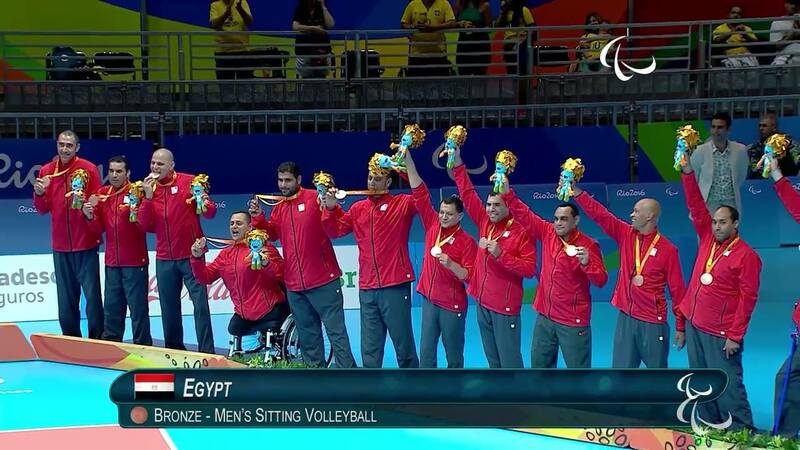 Egypt’s sitting volleyball team clinched the country’s final medal at the 2016 Rio Paralympic Games, defeating Brazil and claiming the bronze medal. The Egyptians, who had missed out on the silver and gold medal events after being defeated by Bosnia and Herzegovina in the semi-finals, defeated Brazil in what was a tightly contested match. The game started off with Egypt winning the first set 28-26, then losing the second and third sets 31-29 and 25-19 before winning the fourth set 25-22. As a result of the draw, Egypt and Brazil battled it out for the bronze medal in a fifth set, with Egypt defeating the host country 15-13. Earlier in the sitting volleyball competition at the Paralympics, Egypt defeated Brazil, the United States, and Germany. Last night’s victory increased Egypt’s medal tally at the Rio Paralympic Games to 12 medals. Egypt’s medals include three gold, five silver, and four bronze medals. All but two of the medals, including a silver in athletics, were won in powerlifting events.